An award-winning digital display and meeting room booking solution for easy scheduling of office spaces and meeting rooms. Joan works with your existing calendars. Great usability & award winning minimal design. Organize and book your meeting rooms and office spaces with Joan Manager. Real-time display, on the spot bookings and a secure Web Portal. Show key meeting information and the availability of up to 9 meeting rooms on a single, elegant, 13-inch display. The leading solution for organizing meeting rooms, showing real-time schedules, providing workplace insights and syncing with existing work calendars. Joan does not need any cables — just unbox and connect to your wifi. 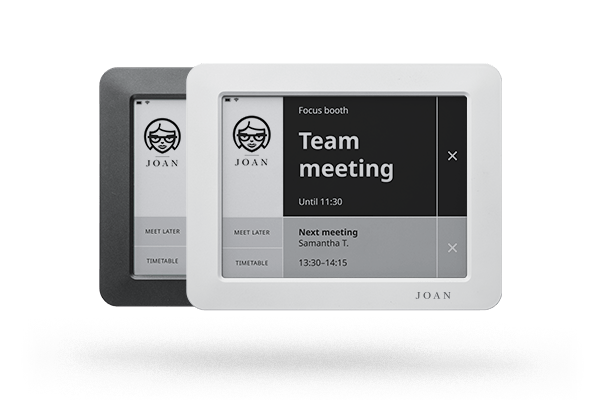 Joan is the most energy-efficient meeting room booking solution. Syncs with existing calendars to display real-time meeting schedules. No IT knowledge or training needed. Join 750.000 users in leading industry companies & organisations who use Joan. Before Joan we had no clear indicator of who was having a meeting and when. Now it’s all there on the display. Joan cleared up all those problems. It just works for us.